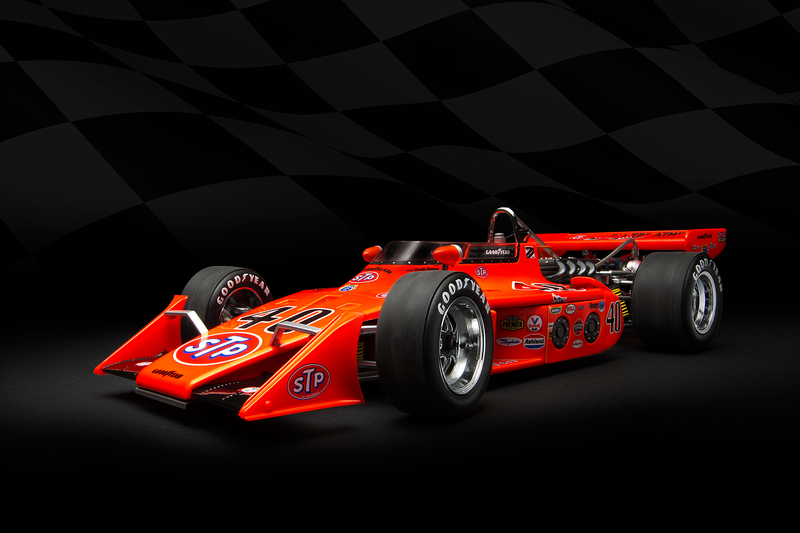 While some of us old-timers remember front-engine roadsters at Indy, many more of us remember the variety of 1960s, ’70s and ’80s rear-engine racers, the Eagle, March, Foyt and Lotus chassis that won the Indianapolis 500 from 1965 forward. Swede Savage’s No. 40 STP Eagle from 1973 is stunning. Drivers like A.J. Foyt, Gordon Johncock, Mario Andretti and Rick Mears piloted these big-winged racers that took aerodynamics to a whole new level, and speeds along with them. Well, Replicarz now brings back some of these colorful Indy Cars, including two new versions that hadn’t been done previously. 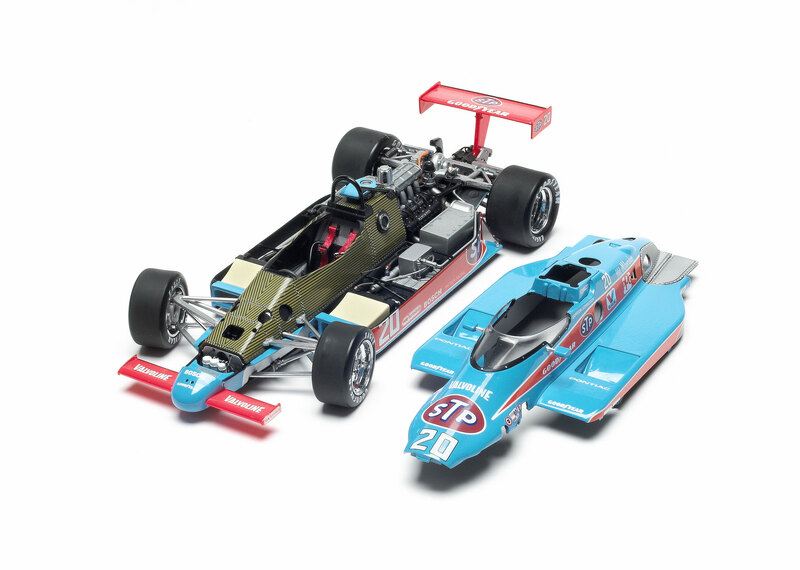 All are 1:18 scale and use molds that previously served to create the fine Carousel 1 models.Being released in May or early June are the STP team cars that Johncock and Swede Savage drove in the 1973 Indy 500 and the March that Johncock piloted in 1984. I’ve got to admit that I’m a sucker for Indy cars, and already own a Carousel 1 version of Johncock’s 1973 Indy winner. But these raise the bar from those already well detailed models. Here’s what I noticed different on the new Replicarz version of the ’73 Eagle. The 1973 Indy 500 winning Eagle driven by Gordon Johncock in the rain-shortened race. 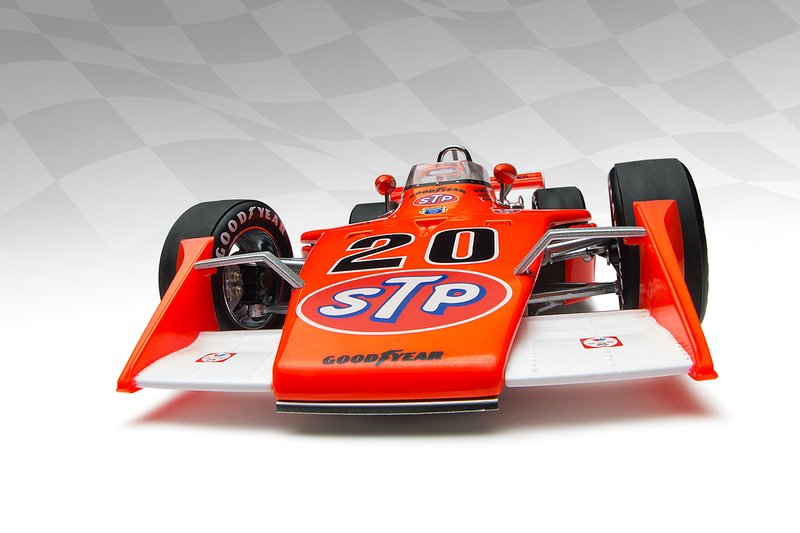 In addition to going with a matte white seat that looks more realistic, the car’s color is more true to the real racer, a Day-Glo orange that STP was noted for as its standout racing livery. The two Eagles numbers, both models, are more true to the actual cars raced in 1973, plus there are a lot more sponsor logos on the side pods, and just below the roll bar on the sides of the cockpit.Brian Fothergill of Replicarz tells me that he and his team have modeled the cars as closely as possible to the way they were raced. That means more logos than a car might have had during practice or qualifying. A web search turned up the 1973 winner and indeed, the decals match very closely. The seatbelts also are black here, not gray as in the former model, and just below the windshield, on the cowl, this model includes Jack Beckley’s name as assistant chief mechanic. That was omitted on the earlier version. Both cars also have beautifully detailed Offenhauser engines and rear suspensions, as did the earlier models. On the Savage car, the interior is a satin black and the monster rear wing is all day-glo orange, whereas the Johncock car has white end plates. This was done to help the teams keep more easily identify the cars as they raced by the pits. While the Johncock car has been done before, the Savage car is a fully new release. Savage was an up and coming racer who had been Dan Gurney’s protégé for several years, racing for Gurney’s All-American Racers in Trans-Am. This was his second Indy 500 in 1973 and he started fourth after setting a new track record of 196 mph, later bested by three other drivers qualifying for the 1973 race. Gordon Johncock’s 1984 STP sponsored March in its brilliant blue and orange trim. Earlier this year Vermont-based Replicarz said it would produce the 1984 pole-winning, record breaking March of Tom Sneva and sponsored by Texaco. Now it also delivers a brilliant blue and orange STP-sponsored March that Johncock drove. Like the other model, this has fine detail and when you slip off the car’s body you see a realistic finely detailed chassis and carbon fiber tub, making this an excellent body-off display car.The March racer also has a black roll bar integrated into the structure behind the driver, a chromed area around the left side exhaust for the Cosworth engine, a chrome support for the side pod skirt and realistic trim and markings. Unlike some more modern Indycar diecast, these look like the real deal with nothing looking like plastic, even when it is. Replicarz creates a finely detailed cockpit too with wiring, cables, realistic gas-faced gauges, shift knob and driver’s safety harness. The two STP team cars will list at $159.99 each, while the Johncock March will list at $169.99. They all come in attractive black Replicarz boxes with large windows for easy, effective shelf display. Plus the attached base is a checkered pattern, so your car looks like it’s sitting in the winner’s circle. You really won’t even have to buy a display case, unless you want to. 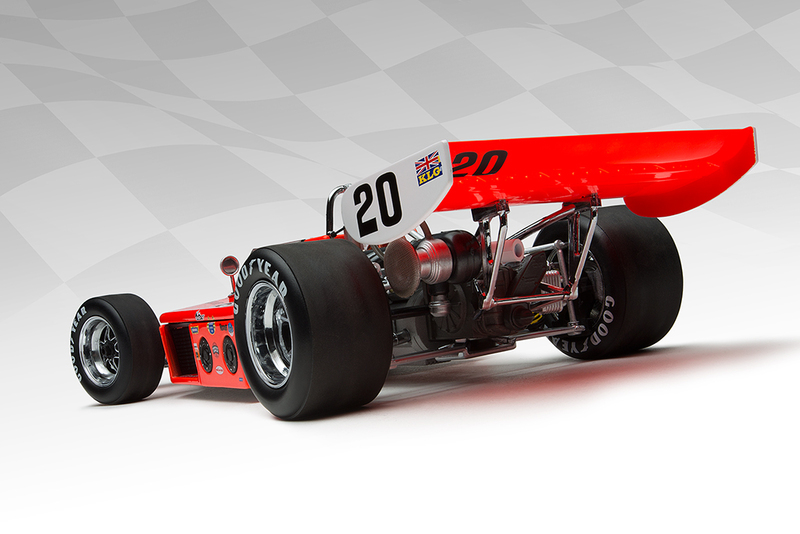 Another view of the Offy-powered 1973 Johncock Eagle. Note Johncock’s car has white rear wing end plates. Editor’s Note: David (Swede) Savage was no relation to the author. But I sure wish he had been. A dynamic driver whose career, and life, was all too brief!